Our Motley Fool contributors explain why they think Mosaic, StonMor Partners, Staples, Rent-A-Center, and Alliance Resource Partners could enjoy big gains this year. Finding stocks that can double is no easy feat. Any number of things can derail optimism and send shares reeling. But if you're willing to take on a bit of risk, our Motley Fool contributors think these top dividend-paying companies could see their share prices double this year, and that could make them worth stashing in portfolios. Read on to see if Teekay Corporation (NYSE:TK) The Mosaic Company (NYSE:MOS), StoneMor Partners (NYSE:STON), Staples (NASDAQ:SPLS), Rent-A-Center (NASDAQ:RCII), and Alliance Resource Partners (NASDAQ:ARLP) are right for your income portfolio. A combination of low energy prices, an oversupplied market of vessels, and slow growth in energy production, have all combined to weigh heavily on nearly every company involved in shipping oil or natural gas over the past several years. For Teekay and the master limited partnerships it operates -- and counts on for the bulk of its income -- things got so bad, the company and its MLPs were all forced to slash dividend payouts substantially. Teekay itself, for instance, paid $1.97 per share in total dividends in 2015, will only pay $0.22 per share in 2017 at the current rate. That's a nearly 90% cut. Needless to say, this move didn't make investors very happy, and drove the massive drop in share prices in late 2015 as shown in the chart above. But that dividend cut has helped give the company and its operating entities more flexibility and breathing room to navigate the downturn while management has also made other moves to strengthen the organization. This includes having sold off a number of older and non-core vessels to improve the balance sheet, and steady progress to establish new revenue streams, including finding work for its newbuilds and vessels coming off contract. Teekay has started turning the corner, and the market it operates in seems to have largely stabilized. There is still work to do, and the potential risk of OPEC's planned output cuts in 2017 could put further pressure on the industry and rates, but chances are the worst is over for Teekay. Furthermore, its shares are still pretty cheap, trading at below the company's book value per share. 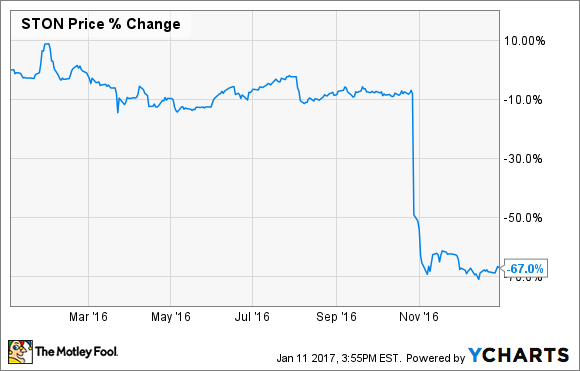 A lot has to go right in 2017, but it's not out of the question that Teekay's stock price could break $20 by year-end if that happens. An increasingly larger and wealthier global population supports demand for food, and that's good news for Mosaic, the worldwide leading producer of phosphates used as fertilizer. Todd Campbell (The Mosaic Company): Mosaic recently acquired Vale's fertilizer assets, and that deal puts it in a perfect position to supply farmers in important markets, including Brazil. The company believes it can generate $80 million in after-tax savings following this acquisition, and investors may not be appropriately valuing how this deal could boost Mosaic's earnings. In 2013, Mosaic's shares were trading north of $60, and in 2015, they were above $50. A tough year for fertilizer prices contributed to a significant sell-off in shares during 2016; however, share prices stabilized last summer, and they've been improving lately. 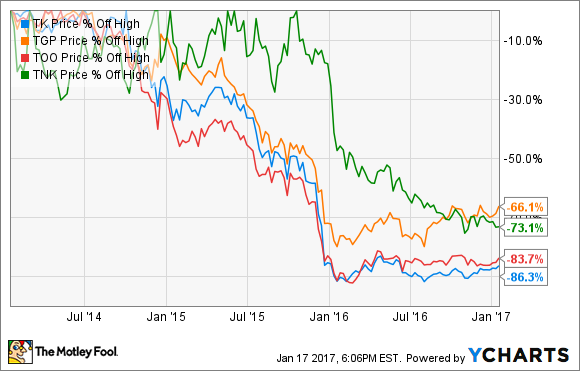 If phosphate prices can find their footing, and Mosaic can deliver on its savings projections on schedule, then there's a chance this stock could rise considerably in 2017. Even if it doesn't, income investors won't come up empty-handed. Shares currently yield a healthy 3.5%. Brian Feroldi (StoneMor Partners): If you're willing to place a heavy emphasis on the word "could," I think StoneMor Partners is a dividend stock that could be set up to go on a big run in 2017. StoneMor is a master limited partnership that owns and operates cemeteries and funeral homes. While the company's business is usually quite predictable, StoneMor has struggled with high turnover in its sales force in recent years. That's a big problem, since the company depends on a quality and motivated sales force to keep its revenue and profits heading in the right direction. Thus far, the company has had a lot of problems filling the vacancies, so StoneMor's revenue and profit have been under pressure. With profits on the decline, StoneMor was having trouble affording its generous dividend payout, so it made the unpopular decision to cut its dividend by 50% in October. Shareholders hated the move and abandoned the shares en masse. Management is trying to hire and train additional sales staff as quickly as possible, and the company has also been cutting overhead expenses in an effort to maintain profitability. While those moves have been slow to materialize, if StoneMor can make progress on both fronts in 2017, its sales and profit could stabilize. That could allow StoneMor to start to think about raising its dividend again, which would make income investors flock back to the stock. While I think this situation is far too dicey to put real money behind, if you're a gambler who wants a dividend-paying stock that offers big upside, StoneMor could be for you. Tim Green (Staples): Staples stock is down quite a bit since its merger with Office Depot fell apart, pushing the dividend yield up to 5.2%. With a market capitalization of around $6 billion compared with expected free cash flow of $700 million in 2016, it's certainly within the realm of possibility that Staples stock doubles this year. Staples' retail business is in the same kind of trouble many retailers are facing. But the company's commercial delivery business, where Staples delivers office supplies and other products to organizations big and small, is performing much better. Revenue has been growing in recent quarters, albeit slowly, and margins have been improving. The threat from online retailers is real, but this business should be more difficult to disrupt than brick-and-mortar retail. For Staples stock to double, the commercial delivery business would need to continue to perform well, and the retail business would probably need to show signs of stabilizing. That second condition doesn't seem all that likely, with comparable sales continuing to slump. I own a very small position in Staples based on the idea that the market isn't giving the company credit for its commercial business. I'm not expecting the stock to double this year, but stranger things have happened. Sean Williams (Rent-A-Center): One dividend stock that's been absolutely abysmal for investors in recent years, but that I believe could be on the precipice of a long-term turnaround, is rent-to-own retailer Rent-A-Center (NASDAQ:RCII). The company's third-quarter earnings report was certainly something to marvel at -- and not in a positive way. Consolidated revenue plunged 12% on a year-over-year basis, with same-store sales declining by 8.4%. The company blamed outage and implementation issues with its new information management system for a good degree of the decline, but weakness in televisions, computers, and tablets also hampered Rent-A-Center's results. However, there are multiple reasons to believe Rent-A-Center could be on the verge of a turnaround. For instance, the hiccups experienced during the implementation of its information management system are more than likely short-term, and if anything it's set the bar low when the third-quarter rolls around next year. Additionally, the rollout of an e-commerce platform should help reduce the company's costs and make the renting process even easier for the consumer. Next, don't overlook the impact of the resignation of now-former CEO Robert Davis. Though Rent-A-Center appears to be on the right track to reducing its expenses and getting its operations back on the right track, Davis' tenure was associated with the company's veritable implosion. Manning the helm on at least an interim basis is Chairman and founder Mark Speese, who built Rent-A-Center into the company it is today. His presence as CEO could be just what's needed to calm skittish investors. There are even macroeconomic trends to suggest that Rent-A-Center's rebound could be imminent. Interest rates are finally beginning to climb, which could sway consumers from charging on their credit cards and moving into renting instead. Likewise, uncertainties surrounding the Trump transition into the White House could entice consumers to spend more cautiously. If so, they could choose to rent and owe lower weekly payments, as opposed to shelling out big bucks for appliances and technology. Sporting nearly a 3% yield, and expected to deliver more than $2 in full-year EPS by the end of the decade, Rent-A-Center looks like it has a decent shot to double in 2017. Tyler Crowe (Alliance Resource Partners): There isn't a whole lot of life left in the coal industry in general, but that doesn't necessarily mean all companies in this industry are bad investments today. One great example is Alliance Resource Partners. The company's coal mines are located in the Illinois Basin (Interior) of the United States. This relatively new coal production source is expected to maintain or even grow production over the next 20 years, while all of coal's losses will come from the more established Appalachian and Powder River Basin regions. Not only does Alliance have a geographic advantage, but management at this coal producer has also avoided the pitfall that has plagued so many other coal miners: debt. Alliance has avoided making multibillion-dollar acquisitions like so many others, and as a result it has a very reasonable net debt-to-EBITDA ratio of 1.12. All the while, Alliance is paying out a very generous distribution that yields 7.88% today. Coal prices improved a bit in 2016 as some supply is getting taken out of the market, and Alliance could benefit from improving profitability as a result. With shares trading at an enterprise value-to-EBITDA ratio of just 3.2, Alliance has the potential to see a strong recovery in 2017. David and Tom just revealed what they believe are the 10 best stocks for investors to buy right now... and Alliance Resource Partners wasn't one of them! That's right -- they think these 10 stocks are even better buys.